The San Mateo Library in San Mateo, California is a symbol of hard work and community involvement. The library started as a concept by the citizens of San Mateo as not only a great local library, but more importantly, a civic building that could accommodate many different functions and events. The creation of the San Mateo Library Foundation provided an organization whose volunteer members performed many important tasks that would help bring the library to existence. Some of those tasks included:1. Surveying the community for their needs.2. Study the impacts to the neighborhood that would receive the library.3. Spend countless hours raising the funds needed to complete the library. 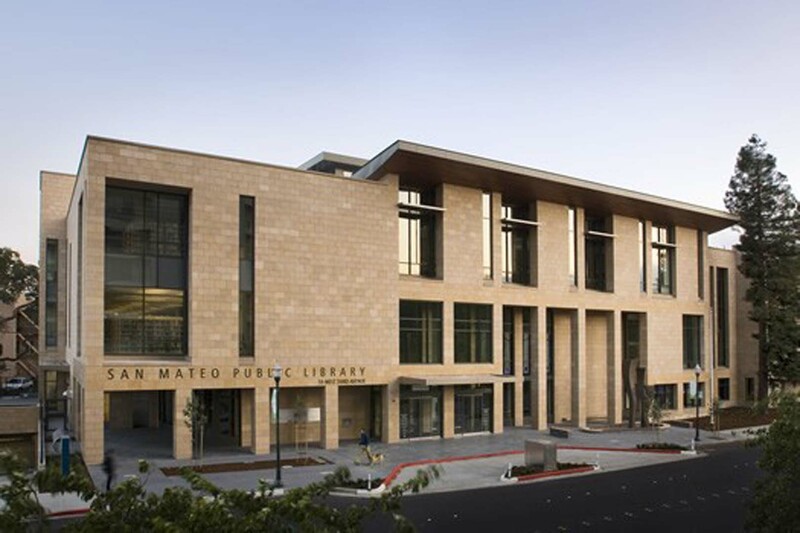 The San Mateo Library Foundation, through its work with the community, concluded that green construction methods were very important and focused the design of the Library around “green” building concepts. EHDD is known for being well versed in green building theories and went to work to produce a design that would meet the requirements not only of the foundation but of the city it would serve for years to come. The success of the final “green” design lead the library to introduce a public education program on sustainability and a “Going Green” information center in the library. The final stone design required countless hours of communication and open-minded design to arrive at what appears to be a traditional mechanically anchored stone veneer. The stone is actually a thin tile and the overall system includes very few mechanical anchors with the main means of attachment being thin set. The adhered veneer system used, and code would require that piece sizes stay within certain pre-established limits. Achieving an acceptable aesthetic appearance and maintaining these limits was one of the biggest hurdles to get over. The building also included interior counter tops, interior and exterior paving an cubic benches. In the end the design was met, code was met and the city of San Mateo received a building that will serve the needs of the community for decades to come.